Thanks so much for taking this journey with us since 2001! 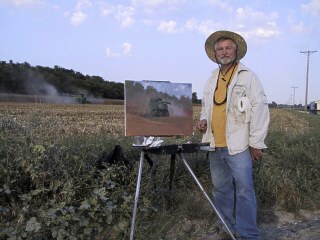 The project “Painting Missouri” involves journalist, Karen Glines and artist, Billyo O’Donnell, who journeyed for seven years creatively writing and painting about their home state – Missouri. The “journey” wasn’t an easy one for it involved Karen working in her office surrounded by piles of books or spending time at the library, wanting to give all the counties the respect and recognition they deserve. Each county is distinctive and clearly has its own personality with remarkable historical and geological features. She also visited with local residents hearing their stories that can rarely be found in a library book. It is the people within these counties who make each one unique and special – and consequently, Missouri, the magnificent state it is. 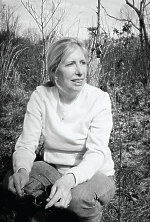 Billyo traveled across the state for years during all seasons capturing the right time and place to paint on location or “en plein air” each of Missouri’s 114 counties and the city of St. Louis while Karen spent many hours, weeks, and months researching, writing, interviewing, and visiting regions across Missouri. Missouri is one of the top five states in the country with its large number of counties and what better way to portray their beauty than to visit them and capture their presence in words and on canvases. In Linn County, Billyo chose the “Dreaming Tree” in the town of Marceline, which is the location where Walt Disney modeled Disneyland’s “Main Street USA,” in Ralls County, his subject was the historical courthouse the community “saved,” and in Scott County in southeastern Missouri, a premier watermelon stand inspired him, where people from across the United States travel just to choose the right one that tastes like no others around. The stories go on and with Billyo talking to people in towns as he painted, and Karen interviewing contacts and researching unique features that often go unnoticed. It was important for Billyo to “catch just the right moment” when he painted and he often camped hoping to paint an exceptional sunset or the next morning’s perfect sunrise. His experiences included being in the midst of a snowy, icy night, or a humid, sweltering day – or anything in between – so that each inspiring season was significantly represented within the state. The combination of words and paintings resulted in the book and 4th revised printing of Painting Missouri: The Counties en Plein Air.